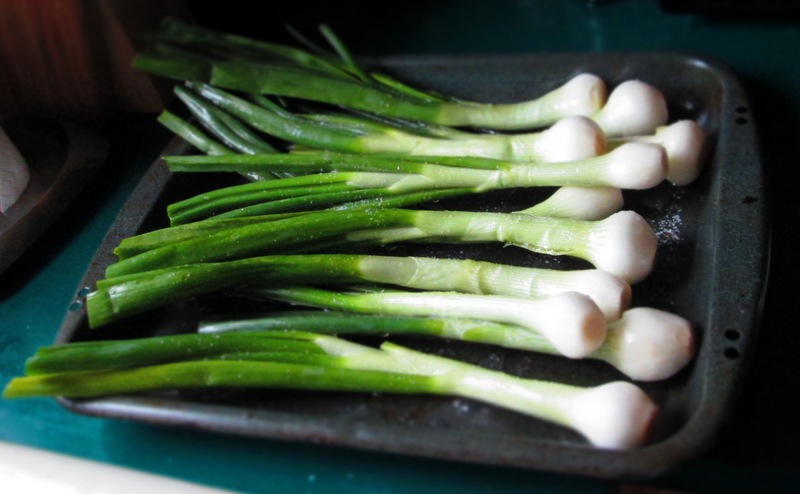 Cambray onions, also known as spring onions, are related to scallions. In fact, they look like a cross between scallions and Texas onions—long green stems with big round bulbs. I’d seen them before but had never purchased them, so when I saw them this past week, I grabbed a few. 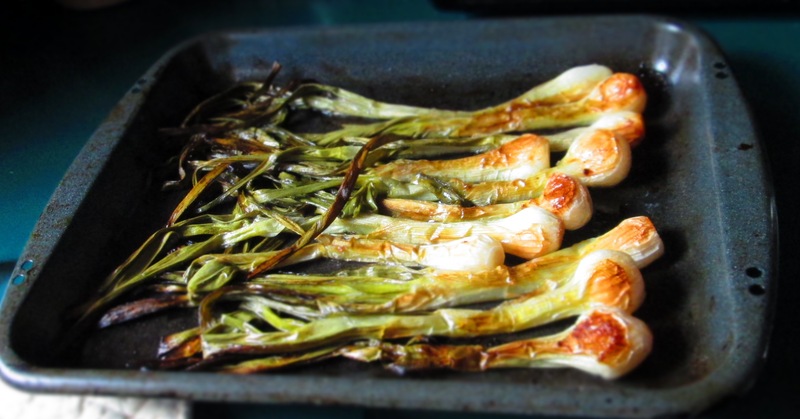 I learned that they are a popular onion in Latin cuisine (in which they are referred to as cebollitas de Cambray or cebolla Cambray), and almost always appear on mixed grill platters. They can be used in many types of preparations, from salads to onion tarts to tacos. Being that this was the first time I was eating them (to my knowledge, anyway), I did what I often do with a new-to-me vegetables—I roasted them. I like to do this because it allows me to sample the new vegetable in its basic form with no added ingredients, besides olive oil, salt, and pepper. Plus, once you’ve grilled a vegetable, you can then add it into many other dishes. So, I roasted the Cambrays until they were caramelized and tasted one by itself. It was sweet and creamy and I could imagine throwing them, cut up, into a dish of pasta or adding them to a stew or chili. I put a few pieces on some flat bread, drizzled some extra virgin olive oil over it, sprinkled a little more salt and pepper, and finished it with some grated Parmigiano-Reggiano. Very simple and very good. Trim onions by slicing off roots and removing outer layers that look brown or funky. Lay onions on a baking sheet. Drizzle oil over onions and rub them to coat with oil. Sprinkle on salt and pepper. Roast about 15 minutes; turn them over and roast another 10 minutes, or until both sides are golden brown. Categories: Gluten-free, New-to-me Food, Recipes, Uncategorized, Vegan, Vegetables, Vegetarian | Tags: cambray, onions, roasting, vegetables | Permalink.